As I said in this post, my hubby is least interested in variety rice though it is made very rarely at my home. Its one of the reasons, I keep trying many so many alternate recipes to make my hubby eat healthy dishes. One option is preparing a raita and other one is to prepare a dry gravy to accompany a variety rice. Whatever different plans I frame, mostly I end up cooking variety rice only when there is a lot of plain rice that is left over. I handle similar kind of tricks in my cooking, to make my husband eat few vegetables that he normally dislikes. He can eats most of the vegetable varieties except bitter gourd. He neglects bitter gourd. He avoids fenu greek leaves and drumstick leaves for the same reason. Both are having many health benefits and I found few easy, very well known ways to include them in our diet. Other than making a dal out of it, I include it in paratha (theplas too), pulao, variety rice, sambar and many other dishes. Instead of having it as such, if we have it with other ingredients, we don't feel the bitter taste. 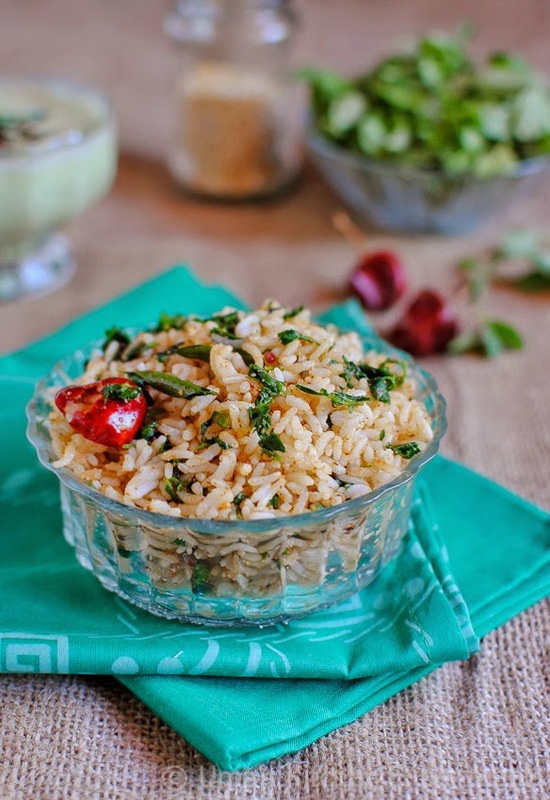 This is one such recipe, which I came across in Simply South Cook book and I prepared it for my hubby using fenu greek leaves and added masala to reduce the bitterness from it. 1) In a dry pan, heat ghee in a medium flame. 2) Add all the ingredients given under "For Masala" and roast it till the urad dal becomes golden brown and spices release nice aroma. 3) Turn the flame off and transfer the ingredients to a plate. Cool down to room temperature. Grind it to a powder once it has cooled down. 4) To the same pan, add ghee and heat it on medium flame. Add mustard seeds and let it splutter. Add asafoetida, broken dry red chilli and curry leaves. 5) After few seconds, add fenugreek leaves. 6) Reduce the flame to low and sprinkle a tablespoon of water. Saute it for few minutes till the leaves becomes soft and tender. 7) Add rice, spice powder and salt to taste. Stir gently till it has blended well without the rice breaking into smaller pieces. 8) Remove the dish from the heat. 9) Serve immediately with any raita. We had it with Greenchilli and corainder raita and egg roast. 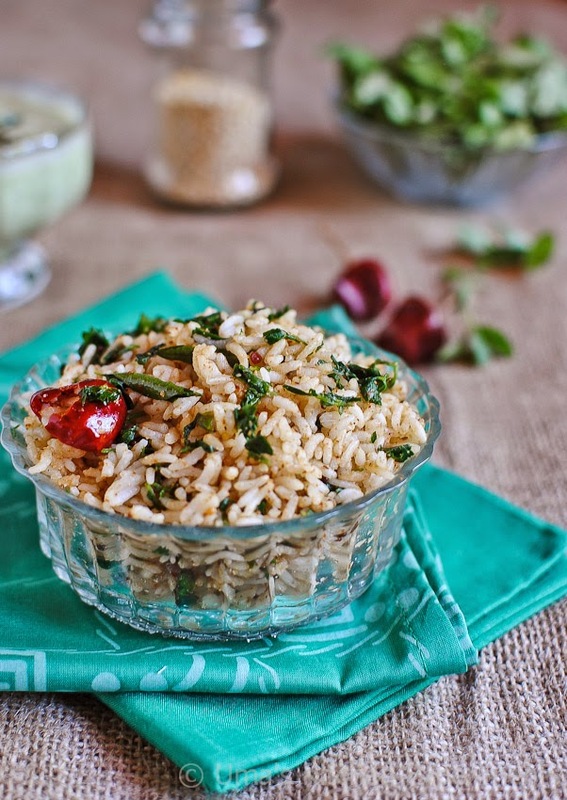 1) Any rice can be used. 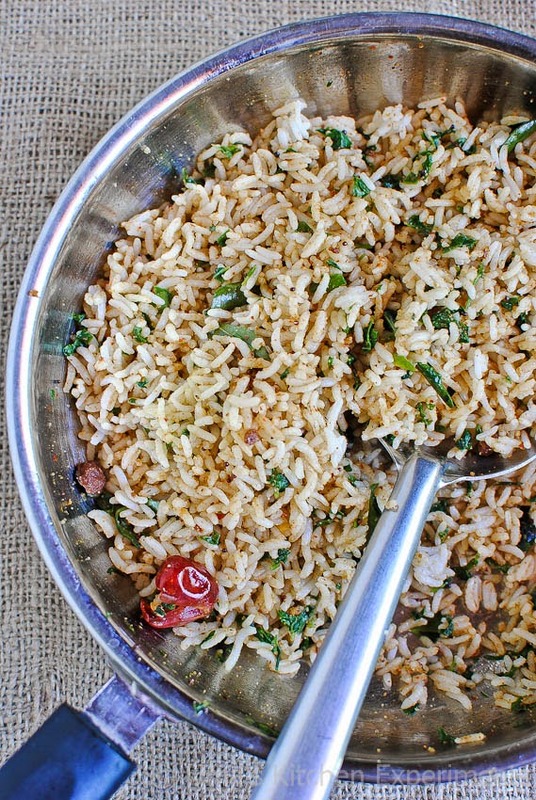 You can also use leftover or fresh rice. Measurement for uncooked rice is 1 cup. Cook it with 2 cups of water. Layer it in a wide plate and allow it cool down till the other ingredients are ready. 2) Adjust the fenugreek leaves quantity as per your personal preference. 3) Adjust the dry red chilli count as per your taste. 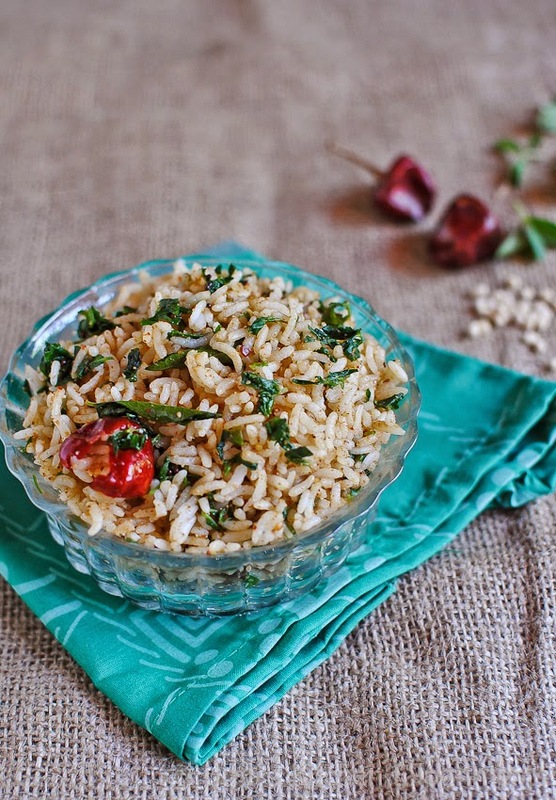 Tempting fenugreek rice...... Lovely clicks! delicious and healthy!! love your clicks! !